Sometimes, it's true, fact is stranger than fiction. The photos are a classic, and the beast definitely has the luck of the Irish. Not only did someone stop, get out of the car and check, but then took remedial action. As a woman, it's pretty dark out there in the country, and as a woman, Ivan Milat comes to mind as well. So in my book she's pretty brave and pretty fabulous. As is the koala. Koalas are famously chilled, laid-back creatures who don't like a lot of excitement. So imagine the shock this little critter suffered after it was hit by a car in Australia and got stuck in the front grille. The vehicle struck the fully grown male koala near Narrawong in Victoria's south west after leaving the town of Portland, west of Melbourne. The driver, who was travelling at about 50mph, hit the brakes after striking the animal with his Ford Falcon on the Princes Highway. 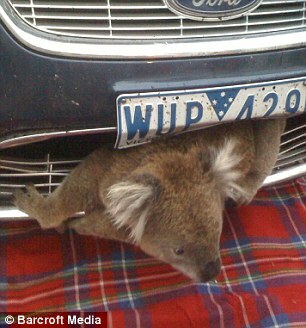 Assuming the animal was dead, he was stunned to find the koala very much alive and wedged in the car's front grille. The driver phoned Portland's after-hours veterinary service before driving nine cautious miles at low speed back into town. Local veterinarian Lisia Sturm was astounded to find the animal had survived without a scratch. 'It looked quite surprised - if koalas can look surprised,' Dr Sturm told ninemsn. 'It had its bum wedged right in there meaning it couldn't get out. 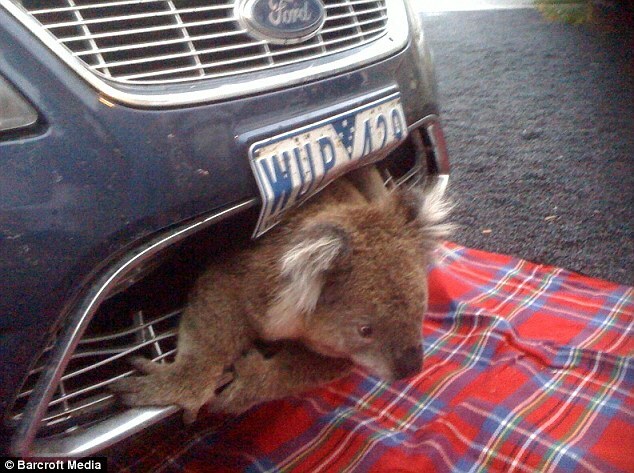 The koala was cut from the grille with bolt cutters. It was kept under observation for the rest of the day before being released back into its prior habitat later that afternoon. Dr Sturm said the koala's amazing escape showed it was important for drivers to stop and examine an animal following an accident before seeking veterinarian treatment.